One of the more interesting ideas in the new wave of cloud-computing services is the music locker. This is a service that lets consumers store their music collections on a remote server and access them from any device, either by streaming the tunes or downloading them. Amazon and Google offer such locker services. But they have a big downside: You have to upload all your music to your locker first. If you have a collection of several thousand songs or more, that can take days as most home Internet connections have slow upload speeds, even if their download speeds are decent. Now, Apple has introduced a locker service that mostly eliminates that problem by doing away with the need to upload the vast majority of your music, while still allowing you to populate your locker with your songs quickly and easily. It’s called iTunes Match, and it’s the last piece in the company’s rollout of its massive iCloud initiative, which includes things like wireless synchronization of contacts and calendars. Once the songs are in the cloud, they also appear in your library in iTunes on computers, or in the Music apps on iPads, iPhones and iPod touch devices. You can stream the music, or press an icon with a downward arrow inside a cloud to download it. You can include up to 10 devices in iTunes Match. Plus, iTunes Match—which costs $25 a year for up to 25,000 songs—covers any song you own, regardless of how you obtained it. That includes songs purchased from non-Apple music services or imported from CDs, or even those that were downloaded illegally. Pressing the cloud icon beside a song downloads it to a device. I’ve been testing iTunes Match on several Macs, a Windows PC, and on an iPad and an iPhone. In general, I found Match delivers on its promises, despite some limitations and glitches, several of which Apple told me it will remedy via software updates. Because of Match, my music collection is now complete and essentially identical on all my computers and on my iPad and iPhone, allowing me to access any of my songs from any of these devices, without manual synchronization via a cable, or paying more than once for the same song. My Match locker is even accessible from my Apple TV device. Match is an optional addition to an existing free service called iTunes in the Cloud, which covers only songs you bought from Apple’s iTunes store, or which you buy there in the future. Songs bought from the iTunes store don’t count against the 25,000-song limit in iTunes Match. Google’s music locker is currently free, but limited to 20,000 songs. Amazon is now offering unlimited music storage for $20 a year as part of a broader plan that allows storing various types of files in the cloud. One nice aspect of iTunes Match is that even if your songs are in a lower-quality format before they go into your iTunes Match locker, Apple streams or downloads them in a relatively high-quality format. In my tests, I scanned and matched the iTunes libraries on several computers containing all my music—about 5,500 songs, a number Apple says is fairly typical for iTunes users. The process took under an hour, including the time needed to upload the minority of songs Apple couldn’t match. However, I have a mostly commercial collection and a fast Internet upload link in my home. I have heard from at least one colleague with a larger library and a slower Internet broadband link, who says it is taking forever to upload his nonmatched songs to Apple. In my case, some of my songs weren’t accepted by iTunes Match, and were marked with cryptic icons that Apple doesn’t adequately explain. A handful were declined because of an unspecified “error.” Apple later told me these files were corrupted, sometimes so subtly that it didn’t affect playback. Others were declared “ineligible.” Mostly, these songs had been imported from CD years ago at a quality rate of lower than 128 kilobits per second. Also ineligible are things like audiobooks or PDF booklets Apple sells with some albums. In my case, these exceptions were reasonable and few, but Apple needs to explain them better. The company says it is working on doing just that. In the case of the subtly corrupt files, Apple says a new version of iTunes coming soon will be more liberal about disqualifying a song. I also ran into two Match problems on my iPhone and iPad that Apple says are bugs that will be fixed in an upcoming release of the operating system for those devices. One bug scrambles the alphabetical order of songs, albums and artists. Another causes album art to either never appear, or to show up only when a song is almost done playing. Apple won’t say when the bug fixes will be ready. There are a couple of issues that Apple has no intention of changing. One: If a person has more than 25,000 songs, Match won’t allow the user to designate a subsection for storage in the cloud. The other: On iPhones and iPads, Apple downloads the whole of any cloud-based song you’re streaming, even if you don’t want it on your device. Apple says it does this for smooth playback, and for playback when you’re offline. 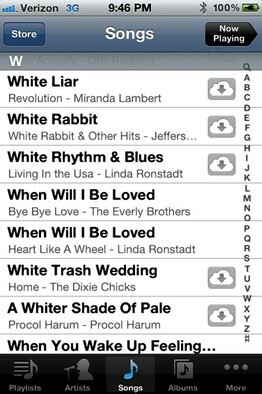 It adds that all songs stored on your hand-held devices are now placed in a special cache from which old or rarely played songs are automatically removed periodically to make room for new ones. In all, I like iTunes Match, and can recommend it to digital music lovers who want all their tunes on all their devices. It’s another nice feature of iCloud, priced reasonably.